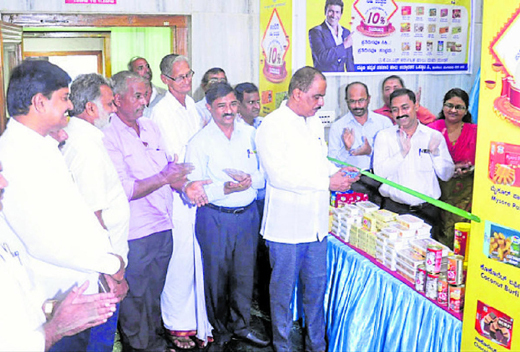 Udupi, July 11, 2018: Speaking at a consultation meeting with Taluk Milk Producers Cooperative societies presidents and secretaries; Dakshina Kannada Milk Union Limited (DKMUL) President Raviraj Hegde said the DKMUL is mulling over fixing minimum price for milk on the model of Gujarat. He said the DKMUL procures 84 lakh litre milk and in this, 40 lakh litre milk is converted to milk powder. If milk fare is fixed on the model of Gujarat, then the incentives can be paid on the basis of profit posted by the milk union. In case, the milk union incurs any loss, then the incentives can be reduced, he said and appealed to the cooperative society members support in this regard. The DKMUL has posted Rs 4.83 crore profit last year with a business turnover of Rs 800 crore. It was started in 1986. By 1996, the union was procuring 50,000 litre milk per day. Now, the union procures 4.82 lakh litre milk per day. He said with the private dairy units reducing its purchase, the amount of milk procured by KMF has increased drastically. He said the DKMUL has launched Nandini Trupti milk in flexi pack. About 35 lakh Trupti milk in flexi pack is supplied to Kerala, Maharashtra and Andhra Pradesh. “Jeera Majjige” will be launched to the market shortly, he added.